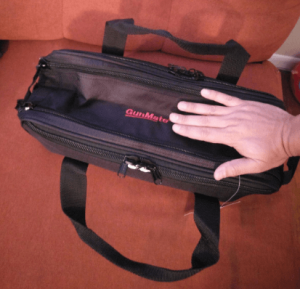 Gunmate Range Bag Review- The best bang for your buck! The Gunmate Range Bag provides one large compartment which can be separated into three to store your ammunition and small guns. The inside of this bag can be customised to suit the needs of anyone who purchases it. The inner compartment can be easily divided into three compartments so you can easily keep track of all your different equipment. These compartments can be used to store your weapons, related equipment, first aid, survival or safety equipment. They are easily created by attaching the patches provided inside the bag to Velcro attachments, which allows you to easily create extra compartments and remove them when they are no longer needed. They do have to be placed where the Velcro strips are; meaning the compartments are already of a specified size and can’t be made smaller or larger according to your needs. The pistol rugs within the bag contains your guns securely and allows you to have them organised so they are easy to remove when needed. There is padding within these pistol rugs to protect your pistols from jolts or being scratched and banged around by other items you are carrying. The bag is made of sturdy material and carries heavy materials well without much sag if the items are distributed evenly within the bag. The zippers are lockable for this product which means you can securely padlock the compartments to prevent unwanted access to your hunting or shooting gear. The attachments of the shoulder strap are made of metal which adds extra strength and durability and a shoulder pad means it is more comfortable to wear for extended periods than other types of bags. All other areas of the bag, including the clips and zips, are made of high quality materials meaning they will last longer and give you a reliable storage bag for your weapons and ammo. Its price is also very good for the amount of features it offers and its strong design. It is also made for simple and easy use, with all the different aspects easy to figure out and it has everything you need to provide a quality bag for storing or carrying everything you need for a hunting trip. This bag can also reliably carry heavy weights, including up to four pistols and large amounts of ammo. 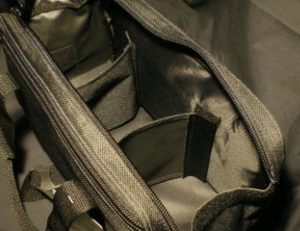 It is guaranteed to carry at least eighty pounds but this weight puts a lot of strain on the shoulder strap and you should ensure you are fit and able to carry that amount of weight before packing that much equipment. It is the perfect size to pack into the car or store away for future use, giving you the ability to always have it packed and organised beforehand making it useful to grab if there is an emergency situation where speed is a necessity. It is a medium sized bag but due to the different compartments it can easily store items and its smaller size means equipment is sorted easier and it improves your ability to access items when needed. It is also tough, and holds up to extended, heavy duty use. Click here to check out review and price. 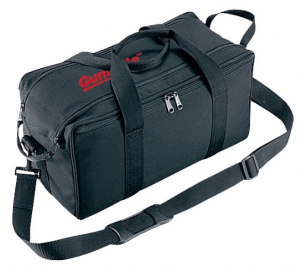 The Gunmate Range bag is not big enough to carry larger guns or large amounts of heavy equipment. It is better suited to those going on a solo hunting trip or a small group where only two weapons are needed. The pistol compartments don’t have Velcro or other attachments to prevent the pistols falling out of their spaces and smaller weapons could slip out. The bag isn’t waterproof meaning in rainy or bad weather items within the bag if not protected could get wet and soggy. Other bags have more usable features and gives a wider range of uses than this particular bag. The shoulder strap can be easily damaged and in some occasions can tear or come off completely. Though high quality, problems with zippers getting stuck or not being properly secured can also be a problem with this bag. 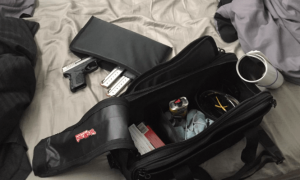 Some people might have an issue with the prominent logo, especially if they plan to use the bag for something other than carrying guns and the logo can be difficult to remove or hide. The bottom of the bag isn’t enforced which can cause sagging if the bag is overloaded making the compartment dividers more inefficient and causing the bag to be more disorganised. 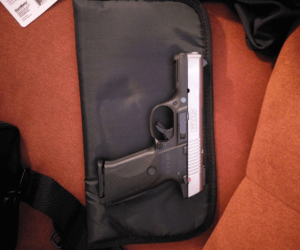 This bag is a small, sturdy bag which best suits somebody looking for a simple and efficient place to carry or store their pistols, ammo and other related equipment. It is recommended for those who are looking for the most affordable option which also provides good value for the amount of money paid. It has a lot of good features including the ability to change one large compartment into three and the special padded areas for your weapons. It does, however, have some flaws with the design including the shoulder strap and the efficiency of the compartments. It is perfect for carrying small amount of equipment from place to place but it should be used for other equipment than pistols.